PSA had two reservation offices prior to Carroll Canyon Road. The first office was actually in San Francisco and was staffed by Richard Tatleman? After San Francisco reservations were processed out of an office near SANMO, just off the runway at Lindbergh Field, San Diego. Located on Friendship Way the office shared a common wall with the Print Shop and had the Business Offices in the front part of the one-story building. I do not have any information about these two offices so if you should have any pictures or comments about these two locations please EMail Michael. PSA recently announced plans for a $1 million Reservations center to be built on 9.3 acres at the Scripps Ranch Business Park in San Diego. Over 20,000 sq. ft. will house the present 350 Reservations personnel and will feature a reception area, lounge, cafeteria, administration office space, locker, training, conference and supervisory rooms, as well as general Reservations area. The center will continue to operate on a 24-hour daily basis and is scheduled for completion in the spring of 1978. Chuck Hansen, Director of Reservations, revealed that the new equipment will be designed and installed by Collins Automatic Call Distributors and will have the capabilities of handling more than 10 million telephone calls per year, from any USA destination. The Reservations system will be tied into the new Compact Programmed Airline Reservations System (CPARS) to provide passenger confirmations, flight scheduling, flight status, group bookings and other passenger service information. 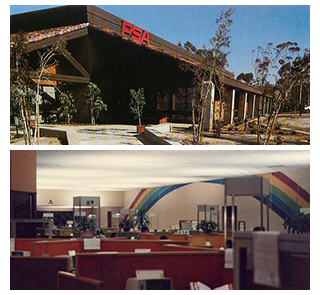 Unlike some airlines who move to a large mid-western American city when obtaining a toll-free, 800 number, PSA decided to remain at home in San Diego. "Our reservations offices have always been located in our main office complex, however, we have run out of expansion space, necessitating the move," explained Bill Shimp, PSA president and CEO. According to Chuck Hansen, Director of reservations, the new complex to be located in Scripps Ranch Business Park is in the initial design phase. The firm of Robert L. Carli and Associates of Los Angeles has been selected as architects. Samuelsons Brothers and Fisher Office Design of San Diego will handle interior design. The Rockwell-Collins ACD system will provide faster and more convenient telephone reservations service within the complex, for PSA and its customers. Ground-breaking for the complex has been set for December. When it came time to design the new res complex, in the process of being built at Scripps Park in San Diego, PSA management left the designing to those people who would be most directly affected -- the res employees. Chuck Hansen, VP-Marketing, asked res sales agents to become involved in the planning and write a letter giving their suggestions on interior design. Each included the reason why they wanted to be on the planning committee. from the more than 30 letters received, 10 members were chosen to coordinate the decor along with Fisher Office Interiors of San Diego. At the main office, where res is currently situated, agents are lined up in rows with little or no privacy. The new plan provides for work stations which will accommodate eight persons, situated in a pattern of a four-spoke wheel. The room itself will be a virtual rainbow of colors, an effect created by using earth and sky tones in a continually changing pattern throughout the enclosure. The res center should be completed in the fall and will cost PSA about $1.5 million to build and design. The center ended up costing $2.5 million and opened in 1979. AS YOU KNOW, THE NATURE OF OUR CALL CENTER BUSINESS IS CHANGING. CALL VOLUME AND TRAFFIC IS DOWN AND US AIRWAYS IS NO DIFFERENT THAN MANY OTHER COMPANIES IN THIS REGARD. OUR SURPLUS STAFFING SITUATION FORCED US TO TAKE A CLOSE LOOK AT HOW WE DO BUSINESS. ADDITIONALLY, AS YOU MAY BE AWARE, SAN DIEGO PROPERTY IS IN THE PROCESS OF BEING SOLD. WITH THIS IN MIND AND EVALUATING ALL RELEVANT FACTORS, SAN DIEGO WAS THE BEST CHOICE FOR THE COMPANY TO CLOSE IN ORDER TO CONSOLIDATE RESERVATIONS OPERATIONS. The San Diego office closed on October 19, 2001. 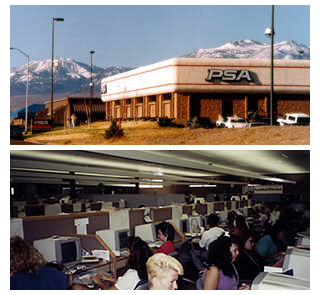 PSA's Reno reservations center was opened on December 21, 1985. The one story 16,000 square foot building was located in the Dermody Business Park just southeast of Reno Cannon Intl. Airport. The center was built to handle calls north of Fresno helping to reduce costs and call-waiting. The company expected to save at least $14 million in telecommunications costs over the first five years. Agents in San Diego were asked to decide whether or not to exercise seniority rights and accept a position in Reno or be laid off. With the threat of the San Diego center closing about 130 agents transferred. Additional agents were hired locally or transferred from other cities and by early 1986 about 290 agents were employed at the center. In late February of 1986 PSA made the decision to shelf the new $1.4 million high-tech "touch screen" computer system. The Reno office closed on September 20, 1995.